Happy Monday! Things are getting hectic for me again, but I'm finally back into my reading groove. I finished reading Blackwood over the weekend so I should have a review up later this week. In the mean time I'm reading Incarnation by Emma Cornwall. I'm a sucker for anything Dracula related. 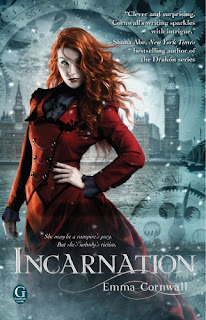 I'm planning to post a giveaway of Incarnation tomorrow so be on the look out for that. Once I finish Incarnation I may finally start Ania Ahlborn's Seed. It's been on the pile forever, and I'm in the mood for a good horror story. I hope you guys have a great week. Be sure to let me know what you're reading! Love the cover of Incarnation. Sorry for the insomnia -- I'm getting the menopause variety so I know it's no fun at all.